Was American Pie name of the plane in which Buddy Holly died? The entire song is a tribute to Buddy Holly and a commentary on how rock and roll changed in the years since his death. McLean seems to be lamenting the lack of "danceable" music in rock and roll and (in part) attributing that lack to the absence of Buddy Holly et. al. "American Pie" reached #1 in the US in 1972, but the album containing it was not released until later. Buddy Holly died in 1959. Buddy Holly died on February 3, 1959, in a plane crash in Iowa during a snowstorm. The same plane crash that killed Buddy Holly also took the lives of Richie Valens ("La Bamba") and The Big Bopper ("Chantilly Lace.") Since all three were so prominent at the time, February 3, 1959, became known as "The Day The Music Died." I drove my Chevy to the levee but the levee was dry, Them good ol' boys were drinkin' whiskey and rye Singing "This'll be the day that I die, This'll be the day that I die." Driving the Chevy to the levee almost certainly refers to the three college students whose murder was the subject of the film 'Mississippi Burning.' The students were attempting to register as black voters, and after being killed by bigoted thugs their bodies were buried in a levee. 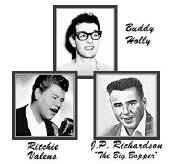 Them good ol' boys being: Holly, Valens, and the Big Bopper, They were singing about their death on February 3. One of Holly's hits was "That'll be the Day"; the chorus contains the line "That'll be the day that I die." "The Book of Love" by the Monotones; hit in 1958. "Oh I wonder, wonder who... who, who wrote the book of love?" **In 1955, Don Cornell did a song entitled "The Bible Tells Me So." It was difficult to tell if it was what McLean was referencing. Anyone know for sure? There is also an old Sunday School song that goes: "Jesus loves me this I know, for the Bible tells me so" McLean was somewhat religious. Music was believed to "save the soul" and slow dancing was an important part of early rock and roll dance events. Dancing declined in importance through the 60's as things like psychedelia and the 10-minute guitar solo gained prominence. Before the popularity of rock and roll, music, like much elsewhere in the U. S., was highly segregated. The popular music of black performers for largely black audiences was called, first "race music," later softened to rhythm and blues. In the early 50s, as they were exposed to it through radio personalities such as Allan Freed, white teenagers began listening, too. Starting around 1954, a number of songs from the rhythm and blues charts began appearing on the overall popular charts as well, but usually in cover versions by established white artists, (e.g. "Shake Rattle and Roll," Joe Turner, covered by Bill Haley; "Sh-Boom," the Chords, covered by the Crew-Cuts; "Sincerely," the Moonglows, covered by the McGuire Sisters; Tweedle Dee, LaVerne Baker, covered by Georgia Gibbs). By 1955, some of the rhythm and blues artists, like Fats Domino and Little Richard were able to get records on the overall pop charts. In 1956 Sun records added elements of country and western to produce the kind of rock and roll tradition that produced Buddy Holly. The "rolling stone" could also be Elvis, although I don't think he started to pork out by the late sixties. he-he! It could refer to rock and rollers, and the changes that had taken place in the business in the 60's, especially the huge amounts of cash some of them were beginning to make, and the relative stagnation that entered the music at the same time. Or, it could refer to the Rolling Stones themselves, many musicians were angry at the Stones for "selling out." I discovered that John Foxx of Ultravox was sufficiently miffed to write a song titled "Life At Rainbow's End (For All The Tax Exiles On Main Street)." The Stones at one point became citizens of some other country merely to save taxes. The jester is Bob Dylan, as will become clear later. There are several interpretations of king and queen: some think that Elvis Presley is the king, which seems rather obvious. The queen is said to be either Connie Francis or Little Richard. See the next note. The third interpretation is that the jester could be Lee Harvey Oswald who sang (shouted) before he was shot for the murder of the King (JFK). In the movie "Rebel Without a Cause," James Dean has a red windbreaker that holds symbolic meaning throughout the film (see note at end). In one particularly intense scene, Dean lends his coat to a guy who is shot and killed; Dean's father arrives, sees the coat on the dead man, thinks it's Dean, and loses it. On the cover of "The Freewheelin' Bob Dylan," Dylan is wearing just such as red windbreaker, and is posed in a street scene similar to movie starring James Dean. Bob Dylan's roots are in American folk music, with people like Pete Seeger and Woody Guthrie. Folk music is by definition the music of the masses, hence the "...came from you and me." This could be a reference to Elvis's decline and Dylan's ascendance. (I.e., Presley is looking down from a height as Dylan takes his place.) The thorny crown might be a reference to the price of fame. Dylan has said that he wanted to be as famous as Elvis, one of his early idols. Lee Harvey Oswald being the jester who ended the reign of JFK and "stole his crown." The fact that no verdict was returned for the assassination of JFK because the assassin was killed so the court was adjourned.